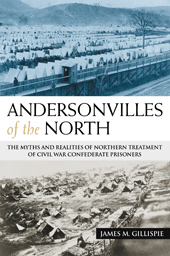 Gillispie, James M. Andersonvilles of the North: The Myths and Realities of Northern Treatment of Civil War Confederate Prisoners. The University of North Texas Press (October 30, 2008). 296 pages, illustrations, index. ISBN: 978-1574412550 $24.95 (Hardcover). Why have Northern prisons, Northern prison guards and Northern prison commandants of the Civil War been so universally condemned despite mountains of primary evidence showing no intentional disregard for Confederate prisoners of war? This is the question author James M. Gillispie asks the reader, and then he sets out to correct what he sees as postwar Lost Cause polemics which roundly condemned places such as Camp Morton, Point Lookout, and Rock Island prisons and which charged that there was an intentional policy of malice toward Confederate prisoners from 1864 to the end of the war. Gillispie largely succeeds in presenting enough primary evidence from Union prison inspection reports along with letters and diaries of Confederate prisoners prior to the end of the war to refute these charges almost completely. Author James Gillispie has a Ph.D. in American History from the University of Mississippi. He currently teaches at Sampson Community College in Clinton, North Carolina. He has published many articles on Civil War prisons, something easily recognizable from his discussions in the text of other Civil War prison works which have appeared since the end of the Civil War. Dr. Gillispie first discusses how Northerners viewed the Confederate prisoners’ experience from 1865 to 1920. He follows with the Southern response in those years, especially firsthand accounts which appeared in Confederate Veteran and the Southern Historical Society Papers. The author then relates how modern historians have interpreted this mountain of information and concludes most modern writers have tended to accept Southern accounts of Federal prison camps written after the Civil War without making sure these accounts hold up under scrutiny. Gillispie has looked into many of these reminiscences. He believes they do not typically agree with Federal prison inspection reports and the first hand information written in the diaries of Confederate prisoners of war at the time they were incarcerated. The author relies heavily on the Medical and Surgical History of the War of the Rebellion, 1861-1865 and the Official Records. Gillispie believes these sources to be the best available with which to study this often controversial subject, and though he admits some of the Federal records must also be looked at with a critical eye, he also points out these records were not created with an eye towards showing them to historians after the war. The author addresses why the prison exchange system broke down and identifies Southern failure to treat Black prisoners the same as they treated White prisoners to be a major cause. He also believes the North is uncritically blamed for the breakdown of the exchange system without the South being held responsible in any way. The meat of the book lies in chapters four through seven. Gillispie first lays out Northern prison policies and makes numerous points in favor of Northern prison administrators who he believes did the best they could for the most part throughout the war. Confederate prisoners, says the author, received at first the exact same ration that Northern soldiers in the field did. He notes that Northern soldiers’ rations were reduced at the same time in 1864 as a decision to reduce Confederate prisoner rations was made, and that this was not a scheme to deliberately starve Confederate prisoners. What follows is a prison by prison look at each of the nine major Northern prisons. Gillispie is as quick to point out times when Northern officials could have done better as he is to show with numbers that Confederate prisoners were less likely to die of disease in six Northern prison camps than they were in Chimborazo, the largest Confederate hospital of the war located in Richmond. In fact, with the notable exception of Elmira, which Gillispie does not do a particularly good job of explaining, eight of nine Northern prisons were better at or nearly the same at preventing deaths due to disease as was Chimborazo. That statistic alone should be enough to show there was no policy, official or otherwise, which directed that Southern POWs be mistreated intentionally. But Gillispie backs those numbers up with even more evidence against intentional mistreatment of Confederates including the frequent firing of Northern officials who failed to bring their prisons up to what were considered acceptable levels. There were several areas of the book which can be criticized to some extent. First, why compare Northern prisons to Chimborazo, a large Confederate hospital? Wouldn’t those being treated at a hospital by definition be weaker as a whole than the men which filled Federal prison camps, making the first set of men likely more prone to die of disease? Although this does serve as a comparison point, some legitimate objections can be made to what might be called an apples to an orange comparison of Northern prison camps to one Confederate hospital. In addition, how much more food and medical care were available in the Northern prison camps than at Chimborazo? Second, the author does not have a good explanation for why Elmira was so much more deadly than the rest of the Northern prison camps. Last, although he does criticize Northern officials for negligence in some cases, the author seemed to quick at points to forgive certain lack of action at some Northern prisons, the failure to drain Foster’s Pond at Elmira being a good example of this. Despite these criticisms, the book’s thesis is proven quite well by the author. James Gillispie has produced an important if a bit repetitive account of Northern prisons which serves as a partial corrective to almost 150 years of completely negative postwar accounts. Gillispie himself believes his work is just a jumping off point for future scholarly study of the Northern prison camps. Readers interested in prisoner of war stories, Civil War memory studies (particularly how Lost Cause articles have been so successful at slanting history), and the Civil War in general will want to own Gillispie’s groundbreaking new work. As a book which goes quite firmly against previous articles and books on the topic, it is sure to create controversy and discussion going forward. I would like to thank Ronald Chrisman at the University of North Texas Press. history tells of a brutally cold winter which both Elmira residents and prisoners alike suffered. I believe it was the first winter there, so I believe the deaths were somewhat skewed from that winter where southern boys from the deep south suffered their first below zero winter. The prison was located near the Chemung River, so fresh water was available from it, probably a consideration. But the Chemung River, a tributary of the Susquehanna was prone to flooding. I remember flooding in the countryside while riding a bus to elementaty school. I wonder how much of that went on during this time? Hurricane Agnes in the 70’s defied all the Army Corps dike and dam work and flooded central PA and into the Corning-Elmira area from the Atlantic Coast. The prison was located very near the town itself, so what disease was in the prison was in the general population as well. Thanks for some possible reasons why Elmira was so much worse statistically than the other Northern prisons. I haven’t read a whole lot of Civil War prison literature, so I wasn’t able to propose my own theories for Elmira in the review. There are lots of photographs of walking skeletons and scarecrows from Andersonville, Libby, Salisburry, et. al., showing dying or near death Union soldiers. Some of the best war photographs come from the Charlotte newspaper, so there were cameras and photographers in the South. Where are the pictures of the starved and abused Confederate soldiers from northern POW camps? Or for that matter, from Jeff Davis’ supposedly starving army? The notion that the winner writes history sure doesn’t hold up to what’s happened since the war between the states.